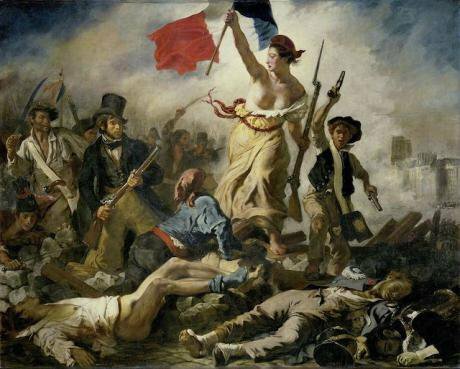 Eugene Delacroix, Liberty Leading the People, 1830. Wikicommons/ Louvre Museum. Some rights reserved. MPs from France, we inform you of the People's Directives for you to transpose them into LAW. - Zero homeless : URGENT. - Income tax more progressive (more slices). - SMIC ( minimum wage for growth) of 1300 euros net. - Promote small businesses, villages and city centers. (Stop the construction of large commercial areas around big cities that kill small business + free parking in city centers). - Large Insulation Plan for housing. (to make ecological savings for households). - That BIG (Macdo, Google, Amazon, Crossroads ...) pay BIG and that small (artisans, TPE,PME– SME and Microenterprises) pay small. - Same system of social security for all (including artisans and self-entrepreneurs). End of the RSI ( the social regime of the self-employed). - The pension system must remain in solidarity and therefore socialized. (No retirement at peak). - End of the tax increase on fuel. - No pension below 1200 euros. - Any elected representative will have the right to a median salary. His transport costs will be monitored and reimbursed if they are justified. Right to the restaurant ticket and check-holiday. - The wages of all French people as well as pensions and allowances must be indexed to inflation. - Protect French industry: prohibit relocation. Protecting our industry is protecting our know-how and our jobs. - End of detached work (where ‘posted workers’ are sent by their employer to carry out a service in another European country on a temporary basis). It is abnormal that a person who works on French territory does not benefit from the salary and the same rights. Anyone authorized to work on French territory must be equal with a French citizen and his employer must contribute to the same height as a French employer. - For job security: further limit the number of fixed-term contracts for large companies. We want more CDI (the default open-ended or permanent work contract in France). - End of austerity policy. We are ceasing to repay the debt interest that is declared illegitimate and we are starting to repay the debt without taking the money from the poor and the poorest but by going after the $80 billion in tax evasion. - That the causes of forced migration are treated. - That asylum seekers are well treated. We owe them housing, security, food and education for the miners. Work with the UN to have host camps open in many countries around the world, pending the outcome of the asylum application. - That the unsuccessful asylum seekers be returned to their country of origin. - That a real integration policy be implemented. Living in France means becoming French (French language course, History of France course and civic education course with certification at the end of the course). - Maximum salary fixed at 15000 euros. - That jobs are created for the unemployed. - Limitation of rents + low-rent housing (especially for students and precarious workers). - Substantial means granted to justice, the police, the gendarmerie and the army. That law enforcement overtime be paid or recovered. - All the money earned by highway tolls will be used for the maintenance of motorways and roads in France and road safety. - Since the price of gas and electricity has increased since privatization, we want them to become public again and that prices fall significantly. - Immediate end to closure of small chains: post offices, schools and maternity homes. - Let's bring well-being to our elderly people. Prohibition of making money on the elderly. The gray gold is finished. The era of gray well-being begins. - Maximum 25 students per class from kindergarten to the final year. - Substantial resources brought to psychiatry. - The People's Referendum must enter the Constitution. Creation of a readable and effective site, supervised by an independent control body where the links can make a proposal of law. If this bill obtains 700,000 signatures then this bill will have to be discussed, completed and amended by the National Assembly, which will be obliged (one year to the day after obtaining the 700,000 signatures) to submit to the vote of all the French. - Retirement at age 60 and for all those who have worked in a trade using the body (a builder or butcher for example) a right to retirement at 55 years. - A 6-year-old child is not able to look after him or herself, continuation of the PAJEMPLOI help system until the child is 10 years old. - Promote the transport of goods by railway. - Prohibition of charging retailers a fee when their customers use the credit card. - Tax on marine fuel oil and kerosene. - on immigration: "Prevent migratory flows that cannot be accommodated or integrated, given the profound civilizational crisis we are experiencing." 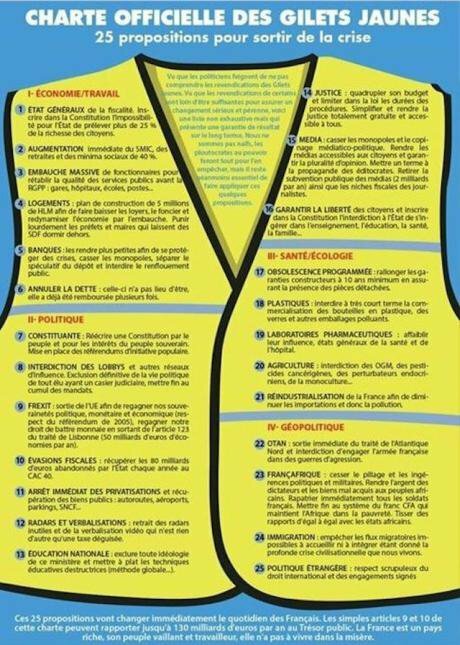 Update on Gilet Jaunes demands.